Rick Spring smiles even as the cold wind and rain blow across his face in the waterfowl blind at Willapa National Wildlife Refuge. The call of cackling geese overhead and the sight of wildlife relax him as he pets Max, his yellow Labrador retriever who doubles as his certified therapy dog. Being in the outdoors is where Spring finds peace. For many people, however, there are barriers to finding that outdoor enjoyment. A disabled Navy veteran himself, Spring knows that spending time hunting, fishing and hiking isn’t always a given for injured veterans or other people with disabilities. That’s why Spring pours his passion for accessibility to the outdoors into building hunting and birdwatching blinds on federal and state lands that are compliant with Americans with Disabilities Act guidelines. A Spring-made blind, for example, is big enough to accommodate two wheelchairs. He does it as a volunteer, donating countless hours to the cause. Spring is one of conservation’s good neighbors, creating opportunities that open the door to nature for people who otherwise wouldn’t get to see a flock of mallards coming in to land or even hear the wind whistle through the Douglas firs. Whether they hold a shotgun or a camera, those aiming to connect with nature need access to enjoy the outdoors, regardless of their physical abilities. That’s why Spring hopes to expand the use of his custom-designed blinds to Oregon and then to the national level so more people with disabilities can have access to the outdoors. It’s impossible to quantify the impact ADA-compliant access has on disabled veterans, says Heath Gunns, outreach manager with Honored American Veterans Afield. The impact on an individual, however, is easy to see when you witness it first-hand. “You’re a 19-year-old kid and you go to boot camp, where they build you up to think you can do anything. Then you get hurt and the first thing doctors do is tell you the things you’ll no longer be able to do. … That is wrong,” Gunns says. Spring is determined to keep that hope alive for people with disabilities. He pulls in partners such as the U.S. Fish and Wildlife Service (Service), Washington Department of Fish and Wildlife, Vancouver Wildlife League, Washington Waterfowl Association, Northwest Steelheaders, and numerous businesses to make it all happen. The Service manages the National Wildlife Refuges, where Spring does some of his best work. 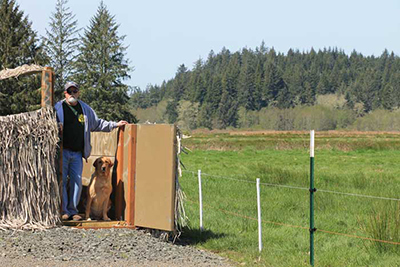 In addition to the blind at Willapa National Wildlife Refuge, two of his custom ADA-compliant blinds can be found at Ridgefield National Wildlife Refuge, and another at Vancouver Lake. Spring is a member of Washington’s Fish and Wildlife Commission ADA Advisory Committee, and he’s finalizing a proposal to build ADA-compliant blinds in each of the commissions six state regions. The importance of Spring's work is underscored by a surprising statistic: 60 percent of requests for Washington’s reduced-fee or special-use permits come from disabled veterans. Overall, there's a high level of public interest in ADA-compliant facilities, according to Sam Taylor, the Washington Department of Fish and Wildlife’s liaison to the seven-member ADA advisory committee. That access-for-all-people policy plays an important role in public lands recreation. A recent Service report shows the outdoors has a strong allure. In 2016, an estimated 101.6 million Americans – 40 percent of the U.S. population 16 years old and older – participated in hunting, fishing, wildlife-watching and related activities. The findings reflect a continued interest in engaging in the outdoors. These activities are drivers behind an economic powerhouse, where participants spent $156 billion in 2016. Spring reached out to Jackie Ferrier, project leader at Willapa National Wildlife Refuge Complex, last year to discuss opportunities for adding a new blind. They had never met prior to the call, but Ferrier quickly seized the opportunity to improve recreational opportunities for the public. 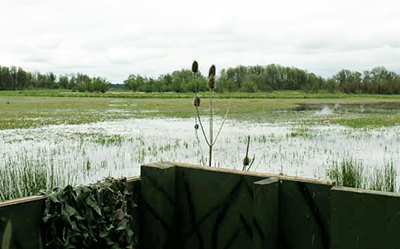 Willapa Refuge plans to add another ADA-compliant blind once some habitat restoration is complete on a different part of the refuge. “Access is a priority for us, and Rick will make sure it happens. He gets things done,” Ferrier says. Spring, she notes, is a part of the refuge’s hunter working group that provides input on hunting opportunities. When not helping veterans get into the field, Spring and Max bring that inspiration to the Veterans Affairs hospital in Vancouver, Washington. Two days a week they spend time with veterans and their families at the hospital, often devoting hours to patients in hospice care. Just like he does in the hunting blind, Max will gently nudge his big yellow head alongside the hand of a veteran. Spring watches as they slowly rub Max’s head with their fingers, hoping it brings them the same peace, hope and memories of the outdoors.